Wholesale Costume Club- Great Deals, Amazing Costumes! For my review I chose the Tina Tater costume and I love it! It is adorable! Isn't she adorable!? Even though it is no where near Halloween I went around the neighborhood walking around and let me tell you; The neighbors were just like.... "What the..." I really enjoyed it because it seemed to really get a laugh out of people. The only disadvantage is that as you know it is very hot in Florida, so as you can imagine, it gets very very hot inside the costume. 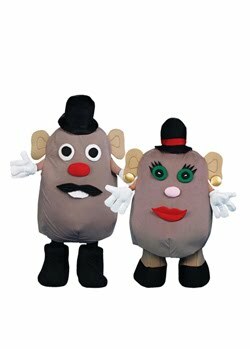 The Tina Tater costume is seriously my dream costume. It's funny, and here's the biggie for me, it hides my identity. 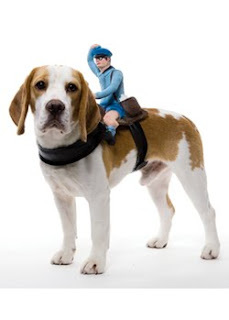 I have to admit I am a little embarrassed to say I do not like to be recognized on Halloween. If I were just walking around that would be fine, but I really love to still get my candy hehe :). With this costume nobody can see my face, so it's perfect. 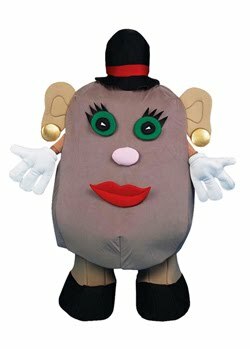 I get my candy and still go unrecognized :D.
Besides the Tina Tater costume they have the Tommy Tater costume, which is like Mr. Potatohead. Aaron refuses to go out with me to get candy, he's just to ashamed. Well guess what? He has no excuses now! Nobody will ever recognize us! And won't we look adorable? We can go hand in hand. I have a feeling everyone is going to be jealous of our spectacular costumes! I'll show a few different costumes that I love, but don't worry! There are tons and tons of costumes! And don't worry there are costumes for your kids too! 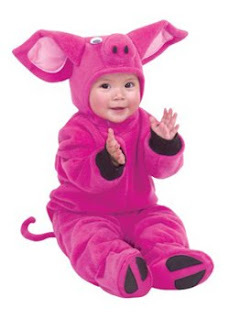 The Fleece Little Pig Newborn Costume: So cute! Those few that I like don't even put a dent in the selection! If you need a new costume this year then you should really check out the HUGE selection at The Wholesale Costume Club. You can get the best costumes at the best prices! Swing by and see what you can find, Bet you can pick just one ;). Oh and a BIG BIG Thank you to The Wholesale Costume Club for providing me with the coolest costume ever! The Wholesale Costume Club is letting me give 2 of you a Membership to the Wholesale Costume Club. (The membership gives you even more discounted prices of there already low prices! For example: The Tina Tater Costumes Originally cost $156.99, Normally at the Wholesale Costume Club the Tina Tater costume would be $107.98, but with the membership you could get it for only $98.46. Mandatory entry: Visit the Wholesale Costume Club website and tell me your favorite costume. Please make sure I have a way to contact you if you are chosen as the winner! The winner will have 48 hours to reply to my email, or a new winner will be drawn. The giveaway Ends July 11th, 2010 at 11:59 pm.And please make sure to leave comments correctly, if it says 2 entries and you only post 1 comment then you will only get 1 entry. ha ha I would choose this and scare the poo outta some teens right back! I love the potato heads!!!!!!!!!!! I love the Orange Butterfly costume. 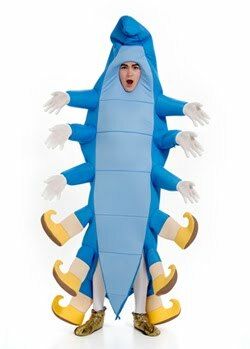 I love the Mens Plus Size Big Daddy Costume! Cut one leg off of the gray tights. Stuff the leg with crumpled newspaper to create a rat tail.